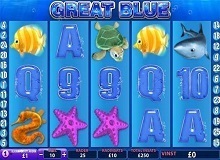 Great Blue is a fun, marine-themed virtual slot By Playtech Gaming. The game uses a variety of sea animals as icons and various shades of blue to inspire a cool, deep-sea setting. The gaming machine has a highly volatile and its RTP factor is 94.3%. The slot has a lot of impressive bonuses such as wild substitutions, scatter pays and extra multipliers, but the free spins bonus is the feature to look out for. You can play Great Blue for real money in Playtech casinos online and with some luck, you might cash in on 10,000 coins jackpot. 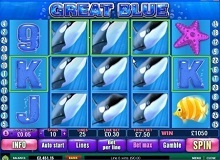 The Great Blue slot machine uses a basic layout design of 5 reels, 3 rows, and a total of 25 betways. This means that you can win in the game in 25 different ways if you choose to activate all the play lines. The paytable features a total of 13 mixed characters which span between marine animals and regular playing card values. The standard symbols are Shark, Turtle, Sea Horse, Starfish, Fish, and Poker card values A, K, 9, 10, J, and Q. The Blue Whale: This is the wild card on the reels and it can either pay or act as a substitute for other icons on the paylines. Sea Shell: This is the scatter element on the grid and it pays in any random position. Select your stake for each betway using the LINE BET button. The minimum line bet is €0.01 and the maximum is €5.00. This means that you can play with as little as €0.25 to as much as €125.00 a spin. Click on SPIN to start the game. The machine also gives you the option of presetting 10, 25, 50, or 99 automatic spins, and you can also turn on the TURBO MODE to speed up things. Once you have done this, you can now sit back and wait for your big win. The variance of the Great Blue game is on the higher side, which means that you can land incredibly huge wins if you’re patient enough. To win a round of this game, all you need is to land a combination of three or more icons on successive reels in a left to right arrangement. The only exception to this rule is the Sea Shell symbol which is the scatter element as it pays in any random position. You will also find that the Wild, Scatter, Shark, Turtle, and 9 award payouts for 2-of-a-kind. 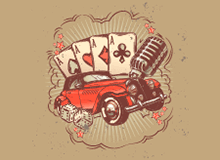 An exclusive combination of 5 wilds awards the highest payout in this casino slot. The reward for this set of matching symbols is 10,000 times your line bet. The wild also doubles your winnings if it completes a winning line. For example, the regular payout for aligning 5 Turtle or Shark symbols is 750x your stake, but it is double to 1500x if a wild substitution forms the win. The scatter pays at the rate of 2x, 5x, 20x, and 500 times your total stake if you get 2, 3, 4, or 5 matching symbols respectively. In addition to the cash reward, you’re also awarded a money-spinning free spins round which comes with very lucrative prize multipliers. This bonus is triggered by landing 3 to 5 Sea Shell symbols on the reels. When this happens, you’re automatically credited with 8 Great Blue free spins. However, before the feature begins, a screen with five Scatters will appear and you’re required to pick any two to reveal a set of freebies, and if you’re lucky, you might get an additional 33 free games with 15x prize multipliers. The free game bonus can be retriggered if you get another set of 3, 4, or 5 Sea Shells during the feature. 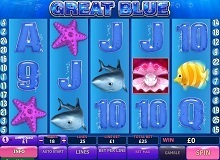 Great Blue is a fun casino slot that seeks to take players on a wild adventure in the deep seas. Embarking on this trip provides you with the chance to meet the mighty Blue Whale and if you’re lucky enough, you might cash in on this daring adventure. As you play Great Blue casino slot online, you’ll realize that the winnings are scarce albeit decent when they come by, and this is mainly because of the high volatility of the machine. It is therefore advisable that you exercise caution when wagering real money, and the trick is to play with a moderate stake so that you can comfortably beat the dry spell as you wait to hit the huge wins.